Leroy Fox - Fried Chicken Heaven! On the way back from the beach we stopped at Smithfield's Bar-B-Q, a local chain with 30 North Carolina locations. We had a hard time finding this place - even our GPS was off at first. When we finally found it we ordered efficiently at the counter and our food arrived quickly. Service was top-notch - more than once someone came by to refill drinks and ask us if we needed anything. Unfortunately I found the BBQ itself lackluster. The meat did not have that smokiness that you crave when you go to a BBQ joint. On a better note, the slightly sweet and elongated hush puppies were quite good. Slaw and fries were average. On the whole this was a decent spot to stop on the way back to Charlotte but next time I'm going to do more research to find a really down home non-chain option that will hopefully have better 'cue. Half eaten BBQ platter with slaw and fries. Pike's Soda Shop is a fun dining destination located in Southend right on the light rail line between Tremont and West Boulevard. I recently enjoyed a tasty lunch here and look forward to returning for brunch and to sample the famous ice cream, especially the milkshakes! Service was professional and efficient and the chicken quiche (below) made for a satisfying lunch with the accompanying side salad and muffin. I didn't taste the reuben but it also looked great. Kids will enjoy sitting at the old-fashioned ice cream soda fountain counter and the lovely patio is available for outdoor dining. On Sunday Pike's is open earlier for breakfast and brunch. Quiche of the day (chicken) served with side salad (not pictured) and a muffin. La Paz, now located at the Metropolitan complex, has taken a downturn since it moved from the South Boulevard location. Even when it was on South I felt much of the authenticity had been lost following the move from the original location in a charming house in Myers Park off Providence Road. Now it feels like another big box chain - without being a chain! My recent dinner was ho-hum, nothing fantastic, nothing horrible. The waitstaff was obviously green and despite the huge space being close to empty on a Sunday evening it took a long time for us to find our waitress to pay our check. I appreciate that La Paz has a diverse menu including salads other than a taco shell with iceberg and several vegetarian dishes but I am on the hunt for an authentic, good and inexpensive Mexican staple in Charlotte. I have a few places I plan to try coming up - what's your favorite and why? Chips - the salsa was tasty. Portabella and spinach tamales with goat cheese - interesting but lacks zing. I was recently provided with copies of two cookbooks. The first, The Daily Feast, is by Esther Rose Graber along with her five daughters and one daughter-in-law who each provide their favorite recipes as part of meal ideas. I like that this book brings in quite a few ethnic dishes such as Khmer Chicken Curry (Ann's menu) and Spinach and Paneer (Celebrations menu) but makes them much more approachable for the North American home cook. 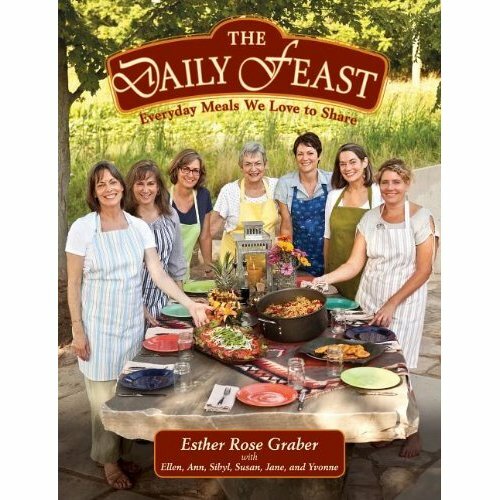 There is something for everyone in this attractive book, which features photographs of almost every dish along with background information for many of the recipes. The second book is Fix-It and Forget-It Vegetarian Cookbook which includes hundreds of recipes plus suggested menus, many of which come from home-cook contributors. This book runs the gamut in vegetarian cooking including appetizers, soups, salads, breads, main/egg dishes, legumes, vegetables and desserts. I like the variety here and that you can probably find a recipe with just about every imaginable vegetable. Several of the soups like the sweet potato and corn chowder and the Jamaican red bean stew look especially enticing as does the lemon cheesecake and the tres leches cake with chile-cocoa whipped cream from the dessert section! 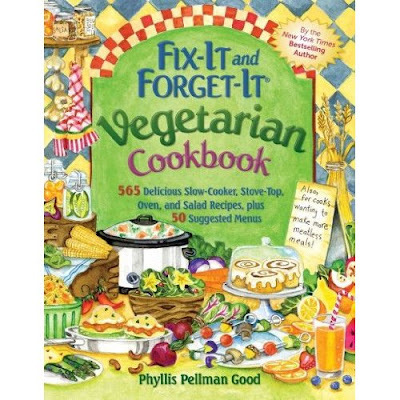 This would make a great gift for a vegetarian who loves to cook - or needs to learn! Fuel Pizza is very convenient for us and we have ordered takeout several times. The pizza here is good and is quite thick and filling. There are several Charlotte area locations and a location in DC. The chicken pesto pizza and the "whole engine" pizzas are my favorite. The wings are also very good and meaty although you have to ask for blue cheese dressing if you'd rather have that than ranch. Also neat: you can order online and they offer both whole wheat and gluten free crust options - a nice touch. At our location (Southend) the atmosphere is lively and fun. I look forward to checking out the original Central Ave. location in the near future as well. In early June we spent a wonderful week at an oceanfront house on Ocean Isle Beach complete with sun, sand, waves and crabbing. We cooked up fresh boiled shrimp most nights but one evening we did venture into Calabash for some fried seafood. Calabash Seafood Hut is classic Calabash fried goodness and the tiny dining room was filled to capacity by 5:15 PM. The shrimp and oysters were my favorite; the hush puppies could be better. After dinner, despite being stuffed, we headed over to Calabash Creamery where they serve up delicious ice cream with creative flavors. I enjoyed the chocolate peanut butter and we had fun resting on the creamery's rocking-chair filled porch. A fun evening for all! Sunset view from our house. Cute front porch of the creamery. Small BBQ platter with onion rings and slaw. We ventured into Mac's Speed Shop recently on a Friday night around 9:30 PM. The live music was just gearing up and the patio filling but we sat inside at one of the front booths. Mac's is a neat place and its motto "Beer, Bikes, BBQ" truly fits. The Southend location is located on our way home from I-77 so we often pass by and see motorcycles lined up. Steele Creek and Lake Norman locations also exist and a new location opened recently in Greenville, SC. In South End Mac's is open until midnight Sun. - Tues. and until 2 AM Wed. - Sat. Service was attentive and obviously knowledgeable. The waitress recommended the onion rings over the fries and they were a good choice with my pulled pork platter. The pulled pork was pretty good although the portion wasn't that big (of course it was the small platter) perhaps the better to try one of the delicious sounding appetizers or the hush puppies, which we skipped this visit. Calvin enjoyed the fish po'boy also. I was a bit skeptical of him ordering fish at a place with BBQ in its name but it was actually quite tasty and I enjoyed that it was blackened instead of the usual po'boy fried. We did sample the banana pudding for dessert - a worthy rendition including some tasty real whipped cream on top. It was such a good portion that I even took some home for later. Calvin enjoyed a couple of the beer selections, which are varied and include the usual and the unusual. We also noticed that Mac's offers half price appetizers Monday through Friday from 4 - 6 PM - we will definitely be back soon! I am looking forward to trying the chili and the Brunswick stew. 4 sauce options - my favorite: the Carolina BBQ Sauce. Fish Po' Boy with rice & beans. Clockwise from top: Maine lobster with tarragon Aioli, marinated mozzarella, tomato and basil, Smoked Salmon with dill cream cheese, egg salad; middle: Tanglewood Farms chicken salad. For Mother's Day I treated my mom to afternoon tea at the Ritz-Carlton Charlotte's Urban Sip. I am a sucker for traditional teas, especially when they include such thoughtfully presented nibbles and such delightful service. My favorite items were the lobster roll and the egg salad as well as the scone and the chocolate and salted caramel tart - the tart was so good we bought a larger one to take to my grandmother! We also had the opportunity to try several different loose leaf teas. Urban Sip is located on the 15th floor of Charlotte's Ritz-Carlton. It is primarily used as an evening lounge/bar, offering many wine and scotch selections, a full bar and light fare. Clockwise from top: Chocolate and Salted Caramel Tart, Opera Cake, Tiramisu on Chocolate Sponge, Signature "Bar Cocoa"; middle: Housemade S'more. White chocolate and orange scones with house-made preserves and Devonshire Cream. I love clotted cream! Downstairs at Bar Cocoa you can buy all kinds of goodies including pastries and coffee. Shrimp & Grits with Andouille sausage - my #1 recommendation. 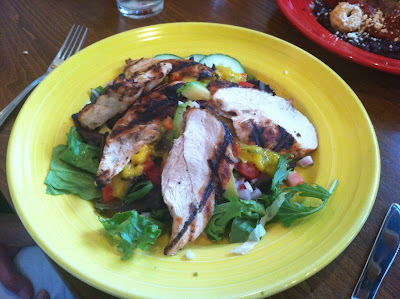 Savor Cafe and Catering, located on West Morehead St., is a cute spot for a tasty lunch or dinner. I recently dined in for dinner and we enjoyed prompt and attentive, but not overbearing service - thumbs up! The shrimp & grits, pictured above, was one of the best items I tried. The meat loaf was also very good as was the famous banana pudding. The soul rolls were crispy but I didn't find them to be as noteworthy as I expected. It would be great if the chef created a variation on the standard chili sauce to go with these, as part of the disappointment was tasting a sauce that comes right out of a bottle. The pad thai was sweeter than usual and definitely a different take if you are used to the traditional Thai variety. On my next visit I would like to try the blue cheese and bacon dip and I look forward to trying the salads, lunch sandwiches and more desserts - in particular the mile high peanut butter pie and the cobbler, which changes daily! Savor is a great addition to West Morehead and I look forward to returning soon. Grilled meat loaf - very good! Banana Pudding - tasty and pretty.